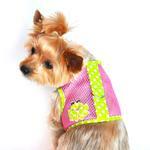 This Under the Sea collection Spotted Frog Mesh Dog Harness features a fun summer design with a patch on the side. Spotted Frog Mesh Dog Harness by Doggie Design - Green and Pink Customer Photos - Send us your photo! Zoey is trying on her new harnesss.